I have run more than my share of races. My tennis shoes have more miles on them than my parents' new car. Doing that a few times a week logging as many miles as my knees will take. I carb load (read eat an entire box of girl scout cookies), drink plenty of water (read coffee) and buy expensive socks. Show up race day and try not to finish last. Or die. So far this has worked for me. Although not well enough for me to start sharing my finish times. A few months ago I had some friends sign up for a running training class. It was cheap. I had hit a wall. I figured it was a good idea even though most exercise classes stress me out, but chances were good that this would better than what I was doing. Running has mostly been something I have done solo and think that an 8 mile run would pass a lot faster with a friend. And Ira Glass doesn’t count. I have tried running with people. But for the most part it just hasn’t worked out. They have been too fast. Or too slow. Or moved away. I either wanted to die, was worried that I’d wet my pants (again) or it just wasn't the pace I wanted. Usually it is ok. I can run far and kind of like the time to myself. My brain is always going in about 20 different directions and there is pretty much no way to stop it. But run 4-5 miles and suddenly it has focused on just one thing. Breathing. And that kind of quiet is a rare and good thing. But in the last year I have kind of hit a wall. I had some medical stuff that put the running on hold for a while. To treat the issue I had to start taking some medicine that makes me exhausted. I’d start running and just want to fall asleep. And I promise I wasn’t listening to sleepy folk music. Again. I’m sure it was equal parts medicine, mental block and the new love in my life: cheese fries from Rodeo Goat (almost as good as Snuffers). Regardless of the reason I have struggled to run more than 5 miles at a time for the better part of a year and I need to find a way like Taylor Swift to “shake it off”. I know most people don’t understand how someone can “like” running. I always try to say that no one likes the first two miles. I spend at least 15 of the first 20 minutes of any run trying to convince myself to not quit. The trick to any long run is just to get past the first two. And then for a while my legs just know what to do, my brain clears and everything about me feels strong. At least until my knees start to ache or I start sucking wind. And then there is something fun about pushing yourself further than you think you can. Just lately, my furthers are getting shorter and shorter. I have run lots of races and halfs no longer intimidate me. But today I was a little nervous. After all, it has been over a year since I have ran 13.1 miles (or anything over 10). This race is in my town- meaning lots of familiar faces at the water stations and blowing past me. Not to mention my husband who had tried to “encourage me” more than once to get my long runs in. Let’s just say I didn’t thank him for the advice. I just mumbled something about having it under control and rolled over and went back to sleep. I am also a teensy bit competitive. I know I am not winning, but I like to beat certain people. Like the 80 year old in front of me. The temperature was perfect. I had plenty of gu and a pretty awesome playlist. 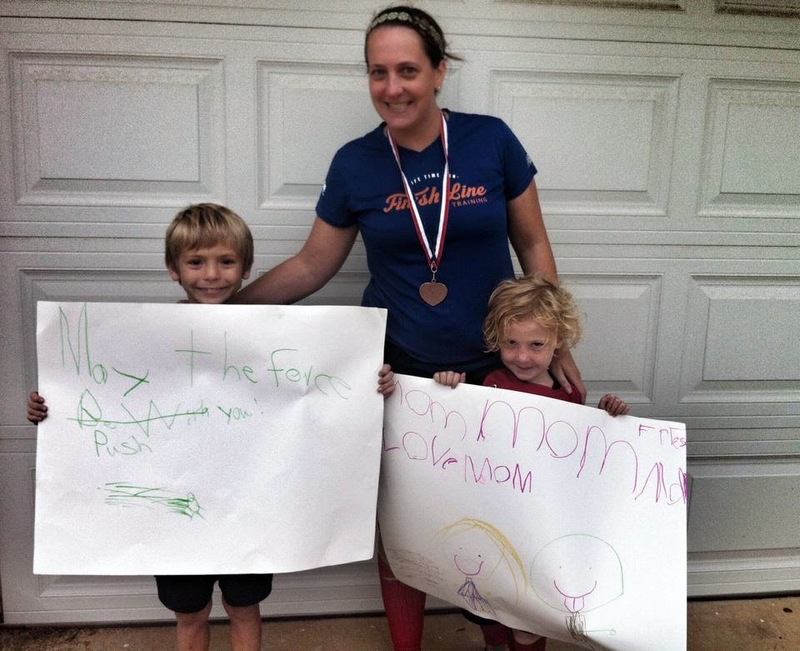 Just as I started to get exhausted my husband and kids surprised me on the course with funny signs. I was not on track to PR but I was pacing ahead of my goal (and last year’s time). Until mile 9 when I hit a wall. At this point it was very clear that I should have spent a little less time on my playlist and more time logging miles. I considered throwing up more than once and every single bone in my feet seemed to hurt. There was even a brief moment that I thought maybe I could call someone to pick me up and drive me back to my car. Thankfully a) I never run with my phone b) my husband would have refused to help me quit unless I needed to go to the Emergency Room which ironically was exactly where the finish line was and c) some well timed Meghan Trainer came up on the playlist. The last four miles were long and hard and painful but eventually my blistered feet made it to the finish line. (Because we were all about that bass). All along the way people cheered, high fived me, handed me water, offered me their snacks, and gave me the thumbs up. And some of those people were on the sidelines but most were people running the race too. People faster than me. Ahead of me. People whose names I didn’t even know, encouraging me keep going. To push through. To finish. When I finally did, I quickly I grabbed a bottle of water and a snack. Slipped off my sneakers and walked my blistered feet in the opposite direction of my car. For the last 2 hours and some minutes I wanted nothing more than to stop running. To go home and take a nap or at least put on yoga pants and eat some cheese fries. Instead, I headed to the corner where some of my family and friends had been cheering, so I could do the same for friends and strangers who were still running. This was a small local race. There were few signs or rows of people. Most of the cheering section at the finish line were wearing medals around their neck. These people were tired and hurting just like me but instead of going home they were cheering on everyone else. I know there are lots of verses in the bible about running the race. Pressing on towards the prize. Recently my church even did an entire sermon series on it. Which I think is kind of weird, but maybe there were not so many sports analogies to draw from in biblical times. But I couldn’t help but think that maybe this was it. This was the prize. Not the medals around our necks. But the community of people who had already been down your path encouraging you to do the same. And I think that Paul got it wrong when he said that that in a race all the runners run, but only one receives the prize. This morning it seemed like we all did.